The Sling School: Are Mei Tais on the way out? Are Mei Tais on the way out? Padded buckle carriers have been steadily gaining popularity over the years at the expense of soft Mei Tais. Yet some of the most-loved slings in our library are the soft-bodied Mei Tais such as the Kozies and the Freehands. Actually, there is every chance that soft Mei tais will regain popularity in some form or another. 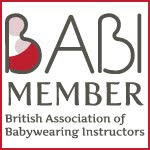 The increasing popularity of babywearing classes and sling libraries will enable more and more parents to master the art of carrying babies in slings. It is only a matter of time before people realise that nothing beats the versatility of a well-designed piece of cloth. In the meantime, trends come and go, and this is fine. As long as baby is carried comfortably and safely.